Want to add some oomph to your sports performance? Try mixing plyometrics into your workout routine. Ever wonder how elite athletes become so strong and powerful? 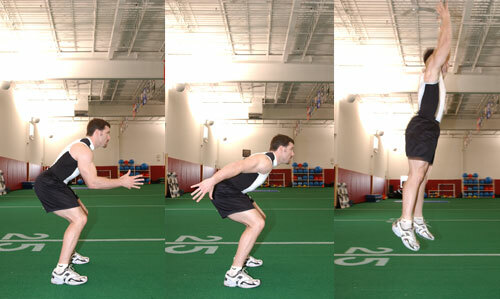 Sport-specific training incorporating a technique called plyometrics often gives them that competitive edge. Plyometrics are exercises that cause the muscles to rapidly reach maximum force. In scientific terms, the muscles are eccentrically contracted and then immediately concentrically contracted to improve neuromuscular function. In plain language, a plyometric exercise involves lengthening or loading the muscles before contracting or shortening them for a fast, powerful, explosive movement. The goal is to allow an athlete to perform better—pitch harder and farther, hit harder and faster, run faster, or jump higher, depending on the sport. Runners may use plyometric exercises—for example, a standing long jump followed by a short sprint and high-knee skipping with jumps—to improve running performance. Powerful vertical squat jumps and fast zig-zag hopping can benefit basketball, football, hockey, and tennis players by improving speed and maneuverability. But plyometrics also benefit the upper body by including exercises such as push-ups with a clap in between each one (think Rocky Balboa), throwing and catching a medicine ball, and swinging a free weight. Exercises such as these enhance performance for racket games, golf, baseball, and other sports requiring arm and back strength and power. But plyometrics aren’t just for athletes; they’re also popping up in workouts for the average exerciser. The increasingly popular kettlebell workout, for example, is based on plyometric principles, and boot camp training and health club classes also include plyometric exercises. Even traditional fitness classes such as step and dance aerobics integrate plyometrics—when the instructor urges you to do those power moves that involve jumping, that’s plyometrics. - Jump onto the curb while walking in your neighborhood. Start with five or 10 jumps and increase to 15 or 20. - Hop sideways and back and forth 10 to 20 times. Try hopping from one foot to the other and also with both feet together. - Add 10 seconds of very fast walking or running with powerful steps and arm swings. Try repeating this every 3 minutes during a 30-minute walk. engaging, and without a doubt, you've hit the nail on the head. The issue is an issue that not enough men and women are speaking intelligently about. I am very happy that I stumbled across this during my hunt for something relating to this. out. I like what I see so now i am following you. Look forward to finding out about your web page repeatedly. the discussion. Usually it's a result of the sincerness displayed in the article I looked at. And after this article "Plyometrics". I was excited enough to post a comment :-P I actually do have a couple of questions for you if it's okay. dead people? :-P And, if you are writing on other sites, I'd like to keep up with everything fresh you have to post. Could you make a list the complete urls of all your community sites like your linkedin profile, Facebook page or twitter feed? on "Plyometrics". I do have 2 questions for you if it's allright. Could it be just me or do a few of the comments appear like they are coming from brain dead visitors? :-P And, if you are posting at additional sites, I'd like to keep up with you. right here regularly. I am somewhat sure I'll learn lots of new stuff proper right here! Good luck for the next! obtained right here, certainly like what you are saying and the way in which you say it.